This is a keto-friendly, low-carb, gluten-free, sugar-free, paleo, and vegan dessert snack. And it's also super delicious! It only had four ingredients and when you bite into it, the texture literally "cracks" in your mouth. Fresh and decadent at the same time, I was surprised how much I enjoyed pulling a square from the fridge at least once a day. The perfect guilt-free pick-me-up. Line a sheet pan with aluminum foil and sit aside. In a large mixing bowl, add all ingredients and mix very well. Pour batter into the lined pan. Using your hands, press firmly in place. Place in the fridge or freezer to firm up. Once firm, remove and cut into bars. Place in the refrigerator. 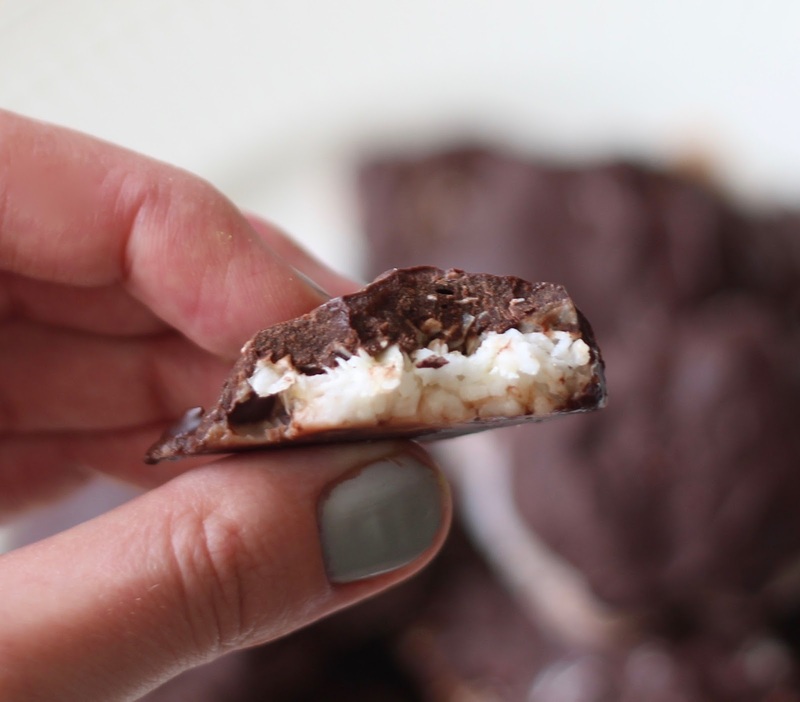 Melt chocolate chips and individually, dip each coconut bar in the melted chocolate until coated evenly. Repeat until all the bars are evenly coated. Refrigerate until chocolate firms up and enjoy!